What did I get myself into? I don’t really know, but so far I’m kinda diggin’ it! One afternoon at about 4:00, I decided I was going to do the Whole30…and start the next day!! I’m currently on day 11 and feeling like I can maybe do this thing! I’m going to do a weekly post with my food that I had each day that week and maybe even add some recipes down the line. So lets start at the beginning and why I decided to do this. A LOT of the gluten-free/paleo foodies that I follow on Instagram were going to start a new round of Whole30 on January 1st and I was intrigued. I started to research what exactly the Whole30 was and all the intricate details. I kept telling myself that I was maybe going to start a round on March 1st or maybe after we get back from DisneyWorld in mid-February. Then I thought to myself that if I didn’t start it NOW I was going to just keep putting it off. Friday, January 5th was the day! I’ll give you my interpretation: This is a total food, body, and overall health reset. This is not about weight loss for me (but many people have seen success in this area). The program says to eat 3 meals per day full of healthy, wholesome, unprocessed, nutrient dense food. No snacking. And no dairy, grains, legumes (peanuts, beans), refined sugar or artificial sweeteners, soy, or alcohol. Foods that are known to be inflammatory, gut damaging, and foods that cause cravings. Hopefully, these 30 days without these specific foods can help me identify those triggers. Pretty sure I already know that TREATS are my triggers. 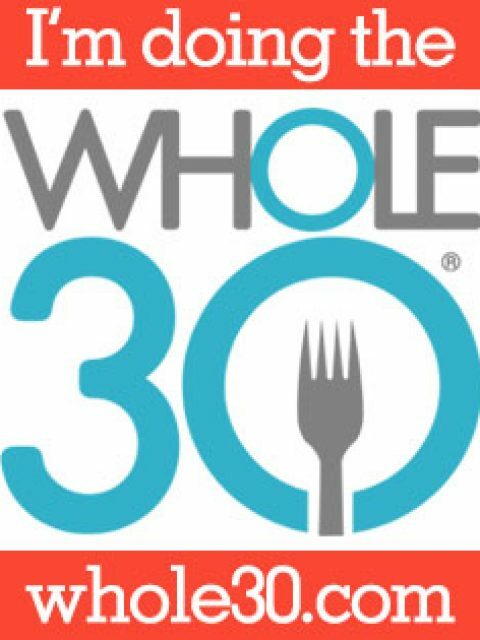 😉 Click HERE to read the exact rules of Whole30! Since my Celiac Disease diagnosis and my change to a gluten-free diet I have been feeling so much better. However, lately I’ve noticed more aches and pains, fatigue, irritability, bloating, laziness in the kitchen and just unsatisfied with my food choices. We’ve also been eating A LOT of processed foods. You see, even though I eat gluten-free, that doesn’t mean I automatically live a healthier lifestyle. It only means that the processed foods that I eat are filled with a lot of other “junk” to make it taste more like the real thing. This is the misnomer with eating gluten-free. It doesn’t necessarily mean it’s a healthier lifestyle. Eating gluten-free for the past 10 months might actually help me in this Whole30 challenge. I don’t need to go through the gluten withdrawals. I already did that back in March! I’ve learned that I have self-control! This is HUGE people!! I went to the Mall of America for some shopping and rides with my family. They all ate Johnny Rockets hamburgers and french fries for lunch and I just drank my bottle of water. I did bring along an RX Bar, beef jerky stick, and almonds as “emergency food” but I decided that I wasn’t starving and that I could wait until I got home to eat. Then we went to get a little gelato for the kids as a treat. I just sat and watched them eat it. I was so so proud of myself. Funny story…I tried to do the Atkins diet many years ago. I only made it about 3 hours before I felt like my brain was eating itself, so I didn’t have much hope that I’d make it through the Whole30 (so far, so good!). More of my time is spent in the kitchen. I know what is in my food. Researching new recipes and making deliberate choices at the grocery store have taken up a lot of my time. I’ve had some major cravings – I just want a gosh darn piece of chocolate after dinner – but I just tell myself I can’t have it and I move on. I am incorporating new flavors and fresh ingredients in my cooking. I am eating vegetables with every single meal! These past 11 days have been really hard and really incredible at the same time. I am so looking forward to seeing how this changes my food habits when I finish all 30 days – I know I can do it! Here is a photo recap of my first week! Breakfast – 2 scrambled eggs,½ avocado, spaghetti squash, a mandarin orange and black coffee. I didn’t take a photo this day, but I’m sure you can imagine what it looks like. 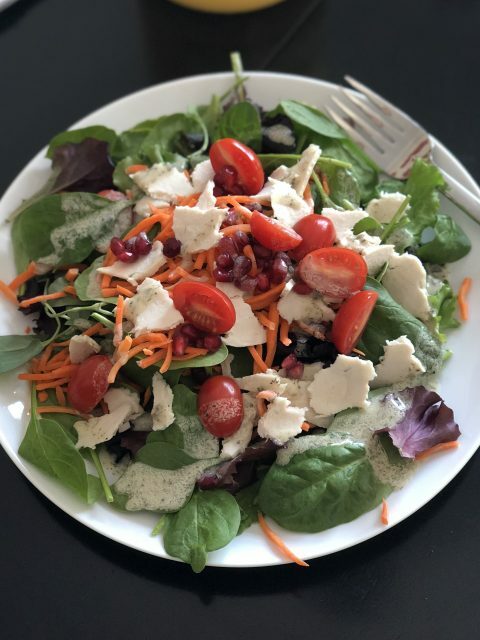 Lunch – Spinach/herb salad with deli turkey, carrots, tomatoes, pomegranate seeds, and ranch dressing (my absolute favorite ranch dressing even when I’m not doing a Whole30 is Tessemae’s). 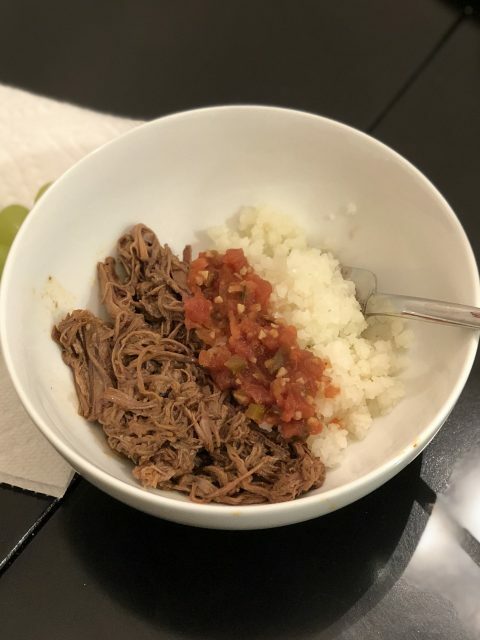 Dinner – Instant Pot barbacoa with cauliflower rice and salsa, and handful of grapes. 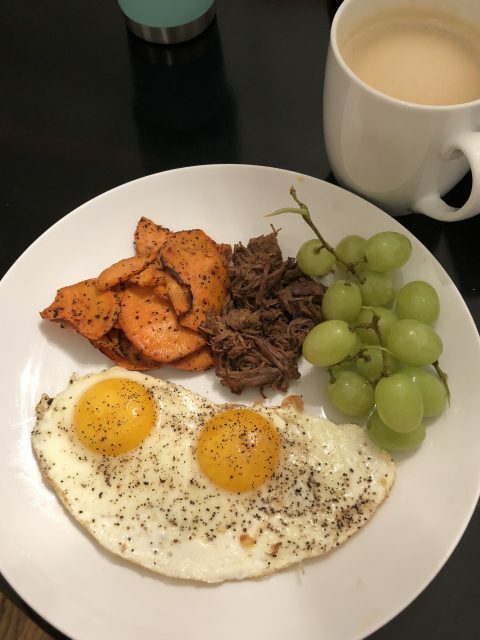 Breakfast – Sweet potato, two eggs, leftover barbacoa, grapes, coffee with collagen peptides and vanilla nutpods creamer. 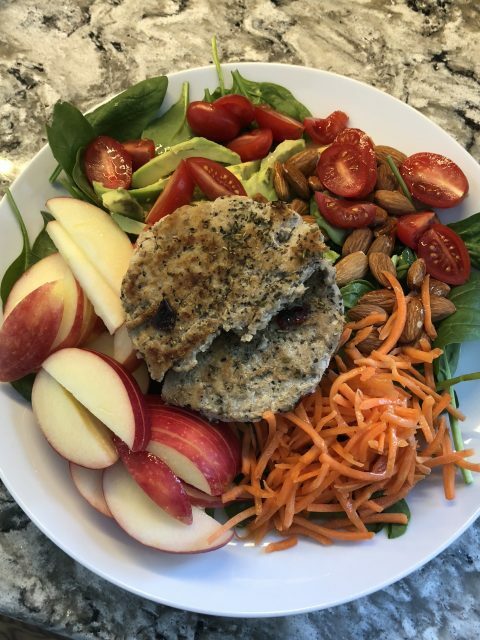 Lunch – Spinach salad with greek turkey burger, almonds, carrots, tomato, avocado, Tessemae’s lemon garlic dressing and an apple. 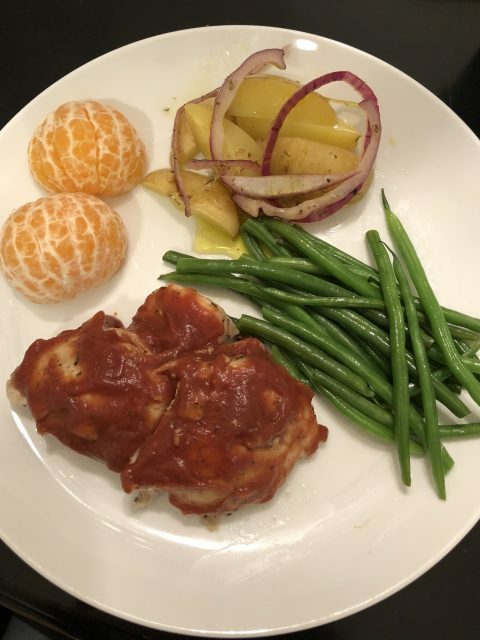 Dinner – Chicken thighs with homemade BBQ sauce, small yellow potatoes, green beans, mandarin oranges. 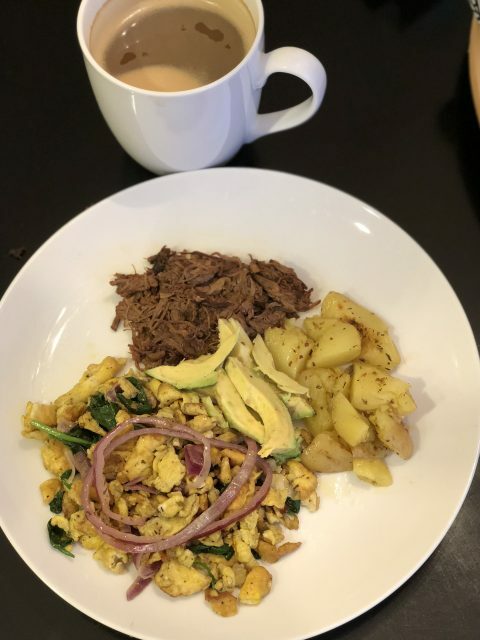 Breakfast – Scrambled eggs with spinach and marinated onions, leftover barbacoa, ½ avocado, leftover potatoes, and coffee with collagen peptides and vanilla nutpods creamer. 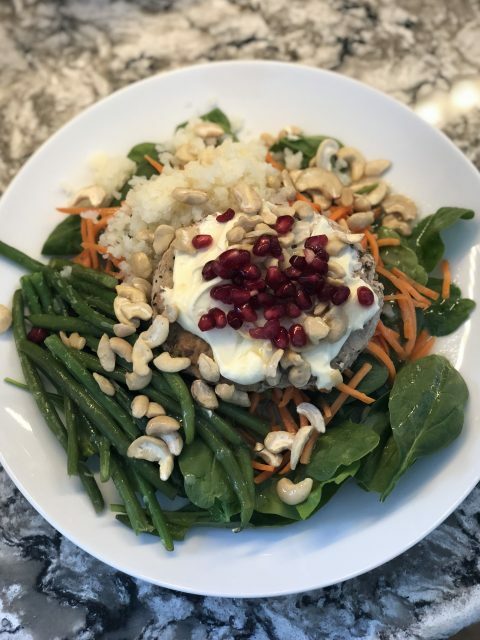 Lunch – Spinach salad with leftover greek turkey burger, homemade mayo, pomegranate seeds, cauliflower rice, shredded carrots, raw cashews and Tessemae’s garlic lemon dressing. 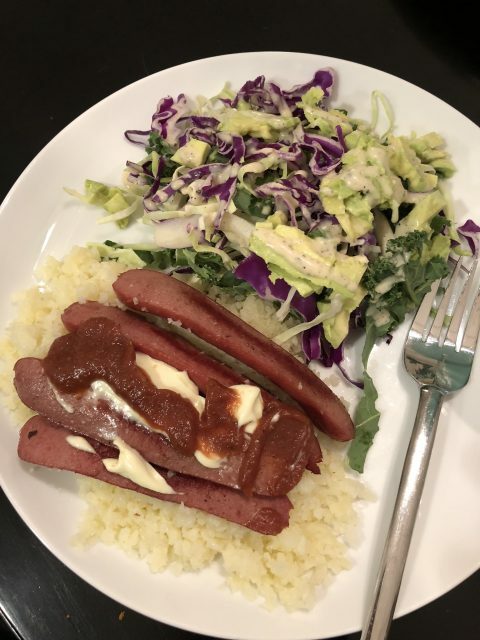 Dinner – Cauliflower rice, two Applegate beef hot dogs with homemade BBQ sauce and mayo, brussel sprout/kale side salad with Tessemae’s caesar dressing. 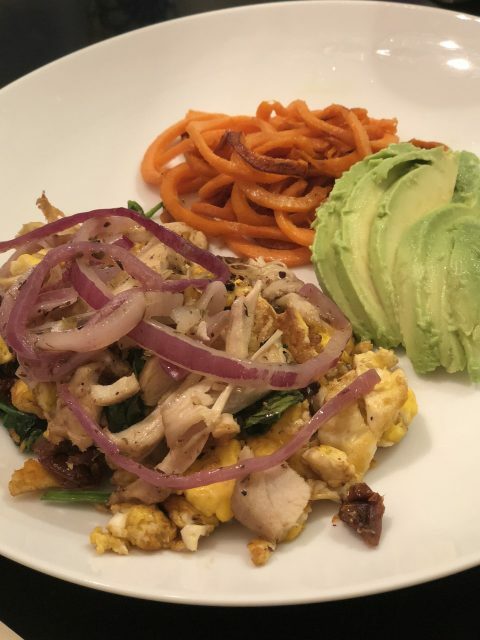 Breakfast – Greek scrambled eggs with sundried tomatoes, spinach, leftover turkey thighs, marinated onions, ½ avocado, sweet potato spirals, and coffee with collagen peptides and vanilla nutpods creamer. 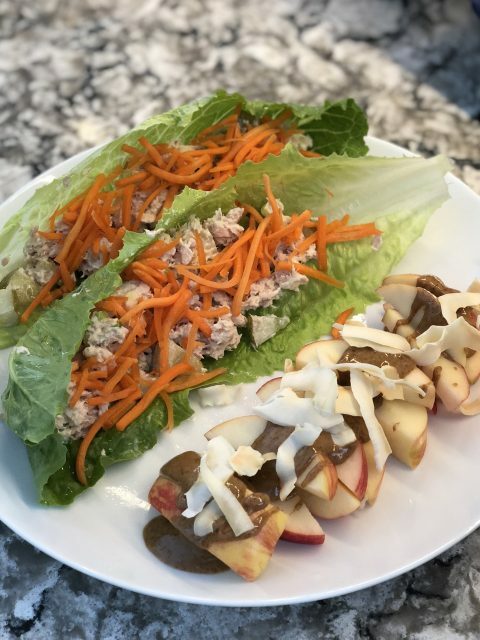 Lunch -Tuna salad lettuce cups with homemade mayo, pickles and shredded carrots, apple with almond butter and coconut chips. 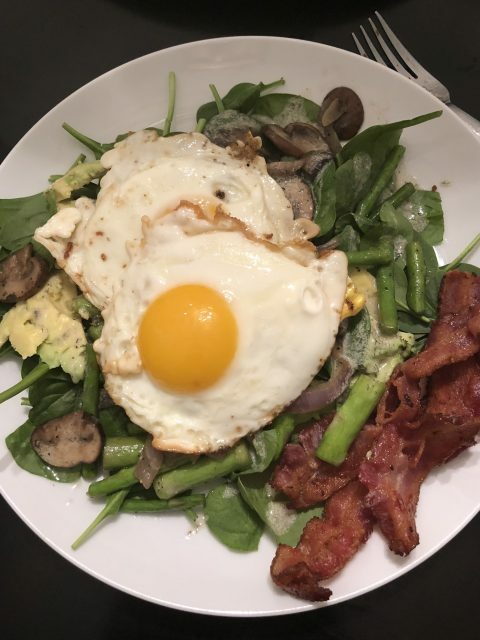 Dinner – Spinach salad with sautéed asparagus, mushrooms, and red onions, two eggs, and bacon. 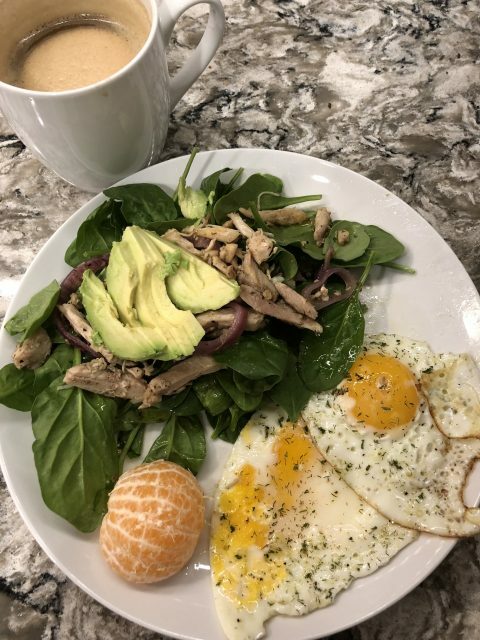 Breakfast – Two eggs with ranch seasoning, ½ mandarin orange, spinach salad with leftover turkey thighs, marinated onions, ½ avocado, and coffee with collagen peptides and vanilla nutpods creamer – I see a trend forming! 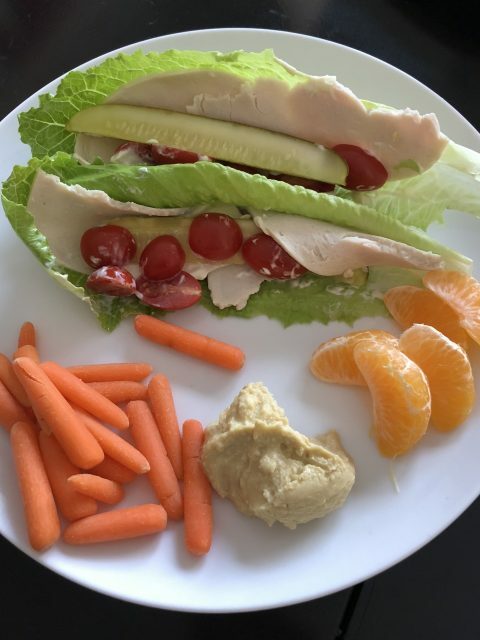 Lunch – Turkey lettuce cups with pickles, tomatoes and homemade mayo, ½ mandarin orange, carrots with babaganoush (basically hummus, but made with eggplant instead of chickpeas). 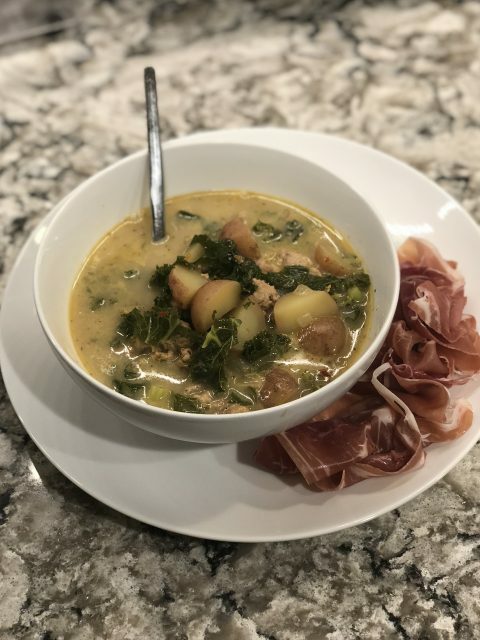 Dinner – Zuppa Toscana soup with homemade pork sausage, potatoes, and kale, and a side of prosciutto. 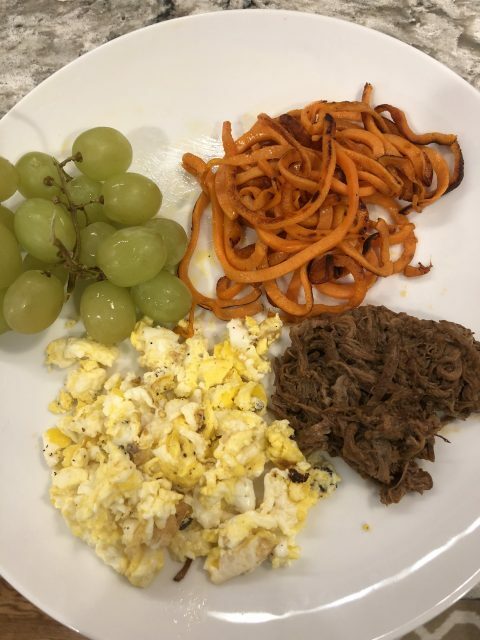 Breakfast – Scrambled eggs, leftover barbacoa, grapes, sweet potato spirals, and coffee with collagen peptides and vanilla nutpods creamer. 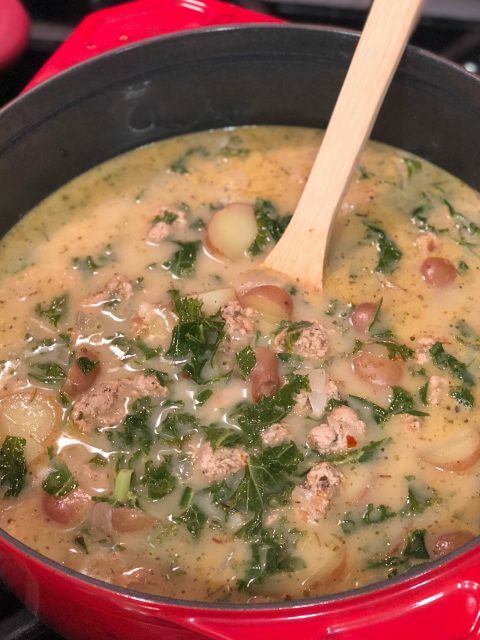 Lunch – Leftover Zuppa Toscana soup. 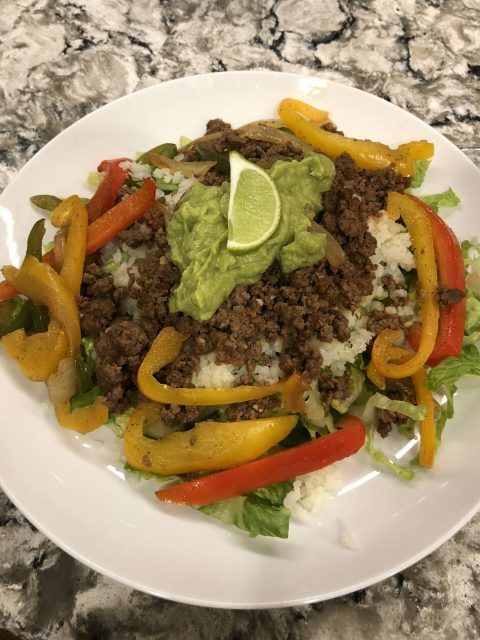 Dinner – Taco salad with sautéed peppers, guacamole, lettuce and lime cauliflower rice. 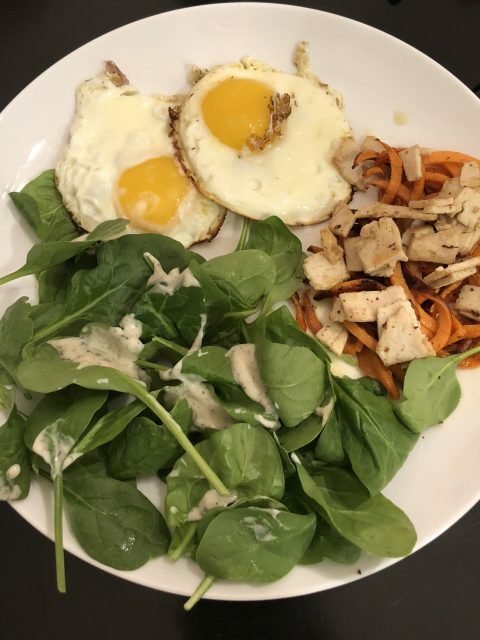 Breakfast – Two eggs, spinach salad with Tessemae’s ranch dressing, sautéed sweet potatoes with leftover turkey thighs, and coffee with collagen peptides and vanilla nutpods creamer (I added some pumpkin pie spice for a little extra). 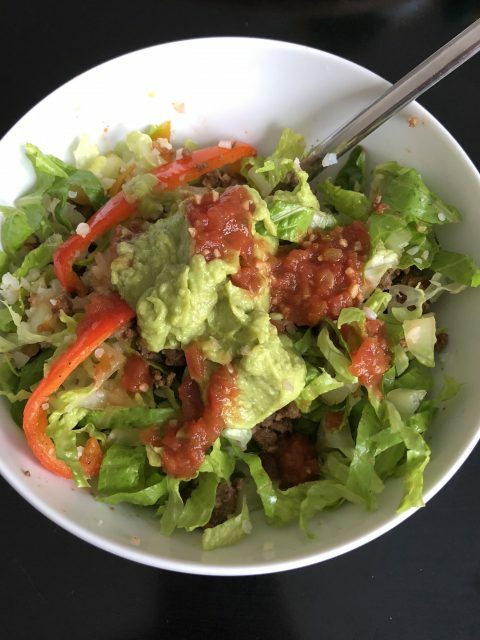 Lunch – Taco salad bowl with cauliflower rice, lettuce, salsa, guacamole and peppers. 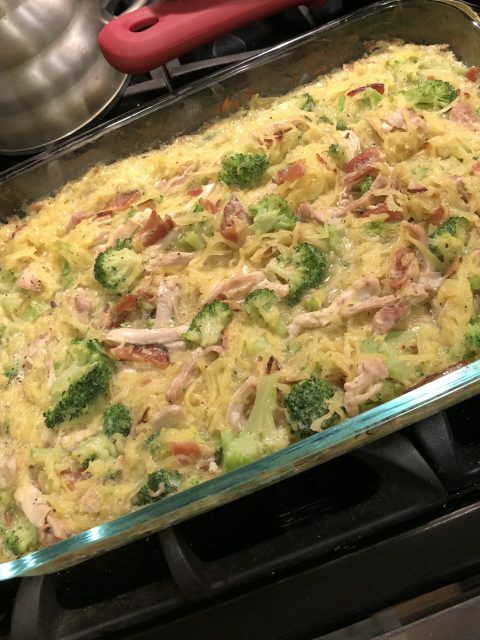 Dinner -Creamy spaghetti squash bake with coconut milk, bacon, broccoli, garlic and chicken. The recipe is from Paleo Gluten Free Eats, but I made some modifications. I’m sure I’ll make it again during my Whole30 so I’ll post what I did a little later! What are some things that kept me going? I made sure that I posted something on my Instagram page to hold myself accountable. Hopefully this will keep me motivated to push on and not totally embarrass myself! MARINATED ONIONS ON EVERYTHING! I never used to be a big fan of onions or garlic until I went gluten-free and started cooking for myself more and appreciating all these wonderful flavors. There is a lovely woman named Teri from a blog called No Crumbs Left who is well-known for her marinated onions recipe. So simple! It’s just one Medium red onion, 3/4 cup high quality olive oil, 1 Tbsp red wine vinegar and 1 Tbsp dried oregano. I like to add a little more red wine vinegar for a little more zing. Leave these out on the counter for up to two days so they are ready to be put on anything. Teri even commented on one of my Instagram photos and I was totally fan-girling! Sparkling water during the day and kombucha cocktails at night. Since I can’t have alcohol, I’ve been mixing half sparkling water and half kombucha for watching The Bachelor or getting sucked in to the black hole that is Instagram. Remember: not all kombucha is compliant because some have stevia extract as a sweetener and that’s not allowed. I’ve been buying gigantic bottles of GT’s Trilogy flavor. Tea. Thank goodness it’s winter because hot pomegranate green tea or a hot matcha almond milk latte is getting me through the afternoons! I seriously think I used my cast iron skillets for almost every meal! They stay on our stove all the time and we have gotten so much use out of them! This is only 30 days. It’s not THAT long!! Come back next week for my Whole 30 Week 2 recap!